Janice Carlyle, formerly of Wonga Poll Herefords, Chinchilla passed away peacefully on Friday 12th October 2018, aged 89 years. 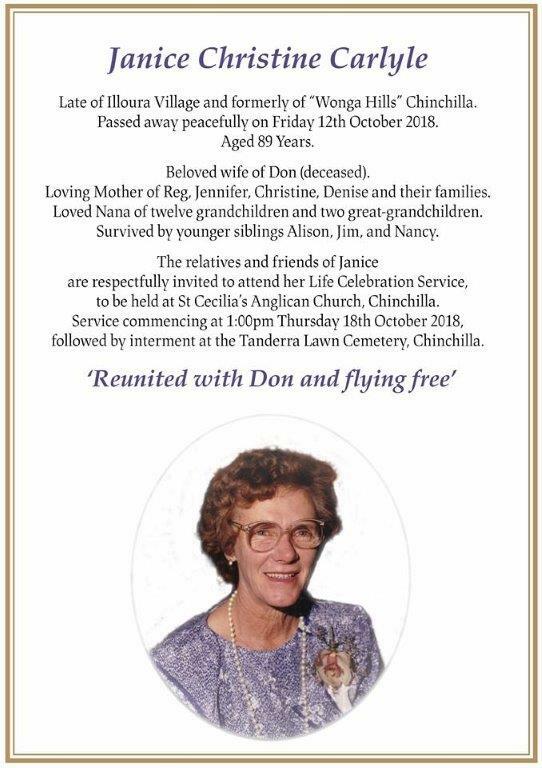 The relatives and friends of Janice are respectfully invited to attend her Life Celebration Service to be held at St Cecilia’s Anglican Church, Chinchilla. The service will commence at 1:00pm Thursday the 18th of October 2018, followed by internment at the Tanderra Lawn Cemetary, Chinchilla.